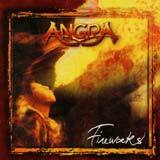 After the much appreciated FREEDOM CALL and HOLY LAND comes Angra's latest album FIREWORKS. Particular attention was given to the sound of this new album, produced and mixed by Chris Tsangarides and partialy recorded at Abbey Road Studio, in London. Well, believe me you can hear the result! Opinions about FIREWORKS are quite divided amongst Angra's fans: some see Angra at its best, others say they have lost a bit of the originality and the charm that made other albums, HOLY LAND for instance. But hey guys, this album rules! The whole band's play is great, mastered, and above all full of freedom. The album's pace is not very fast, but every song is enjoyable and has its own power. FIREWORKS is quite a balanced album, lots of mid-tempo, some ballads, and some more aggresive songs; but from the beginning to the end it remains Angra. It is realy a must-buy for Heavy-Metal lovers, and also for those out there who play music! Believe me, the band's play, be it vocal, guitar, bass or drums, is simply amazing... So if you like powerfull Heavy-Metal with killer riffs and vocals, do not hesitate, BUY this album!